In collaboration with Dr. Fay Horak and Dr. Robert Peterka at OHSU, Rob Creath and I studied individuals with vestibular loss to understand how they use sensory information compared to individuals with intact sensory systems. Pictured (larger view) is a vestibular loss subject standing on a surface that can rotate around the ankle joint in a rhythmic fashion. This rotating surface makes the task of standing much more difficult and we study how body position is controlled as the surface rotates at different rates. At the same time, different conditions vary the available sensory information to see how balance control is affected. One of the important findings was that the postural control of vestibular loss individuals improves enormously with light touch contact of a stationary surface. 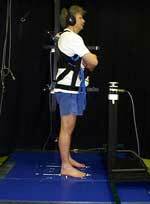 With light touch, their postural control is equivalent to healthy individuals with an intact vestibular system. vestibular function. Experimental Brain Research, 145(3), 323-333. Lackner, J.R., DiZio, P., Jeka, J.J., Horak, F.H., Krebs, D. & Rabin, E. (1999). Precision contact of the fingertip reduces postural sway of individuals with bilateral vestibular loss. Experimental Brain Research, 126, 459-466. Jeka, J.J. (1998). Touching surfaces for control not support. In D. Rosenbaum & C. Collyer (Eds. ), Timing of Behavior: Neural, Computational, and Psychological Perspectives. Cambridge: MIT press.